High ceilings are a blessing in any home. They draw the eye upward, expand our sense of spaciousness and have the potential to elevate our mood. High ceilings also offer a huge variety of practical benefits for our living spaces. It can be tricky to design and decorate a space outside our immediate reach. High wall space is often under-utilised as we tend to focus on things at ground level. But once we focus on maximising the potentials of high ceilings, the results can be tremendous. The most dramatic changes are obviously seen in small living areas. Small living is a massive trend at the moment and this has generated a lot of creative solutions. But even if your home is large, there are plenty of ideas that can be modified to suit your space. So weather you're interested in redecorating, creating extra storage or even a separate sleeping area, come with us on a photo tour to explore the possibilities. Before we explore all the practical options for taking advantage of high ceilings, we thought it might be good to emphasise the single most important aesthetic consideration when choosing how to furnish or decorate your lovely high ceilings. The number one rule is to think about creating vertical lines. That doesn't just mean plonking in some high shelves. Look at the lovely, fine long row of lights hanging over this long dinner table. They work to really emphasise the height of the room and create a real sense of spacious grandiosity that might otherwise be lost in this big room. 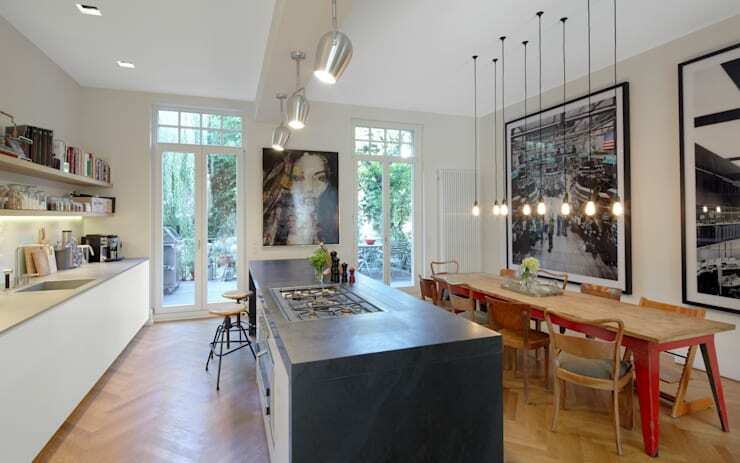 To really amp up the effect, a parallel set of silver lights along the kitchen island and large artworks have been added. For those with the space, a fabulous mezzanine is a fantastic way to take advantage of high ceilings. While the lowered height of the room underneath may concern some, the benefits far outweigh the costs. No matter how small or large the mezzanine, dedicated lighting for both levels is a must. If floor space is an issue, consider a very narrow mezzanine that might work as a reading nook, small study or even a private yoga studio. While there will be little sound barrier between the two spaces, the simple ascension will create a psychological boundary and a sense of privacy. This swing is sure to be a hit with children and adults alike. It's the kind of unique and playful addition that turns an apartment into a homely space. 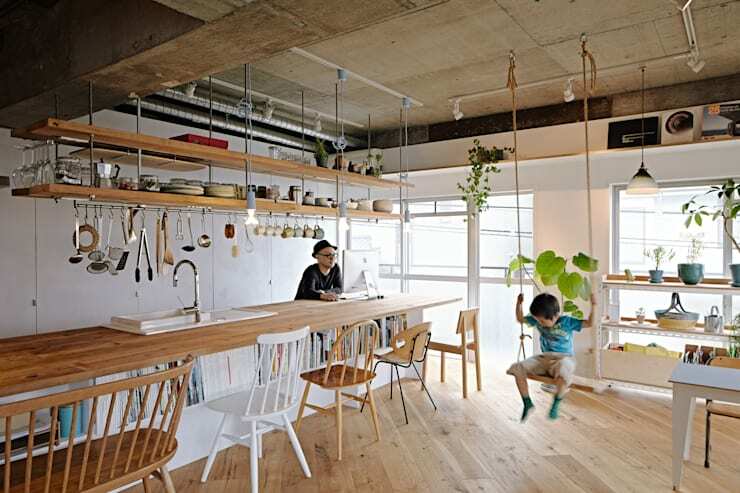 But swings aren't the only option, hanging plants, bookshelves, kitchen shelves as seen here or even quirky works of art might work for your space. The length of the hanging attachment doesn't need to be long or intrude on the traffic zones at all. We hate to admit it, but there are a couple of small downfalls to high ceilings. 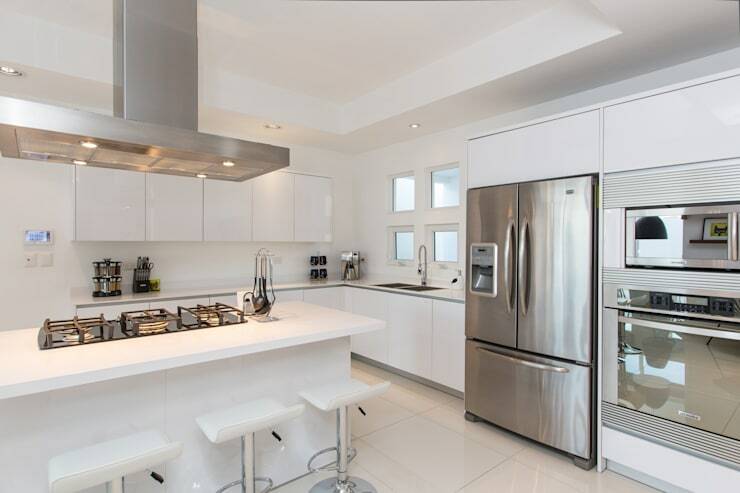 Firstly, the added space means that it will cost more and take longer to warm or cool down your space. The other factor is that noise will tend to travel a little more. To cut down on these small problems, you may want to create a false ceiling. Have a look at the partial false ceiling in this kitchen by architects Arsciniest Group. The wonderful thing is that the lowered ceilings have been used to contain the wiring and house the LED lights. While the ceilings in this living room aren't particularly high, they are more commonly seen in most modern cities. 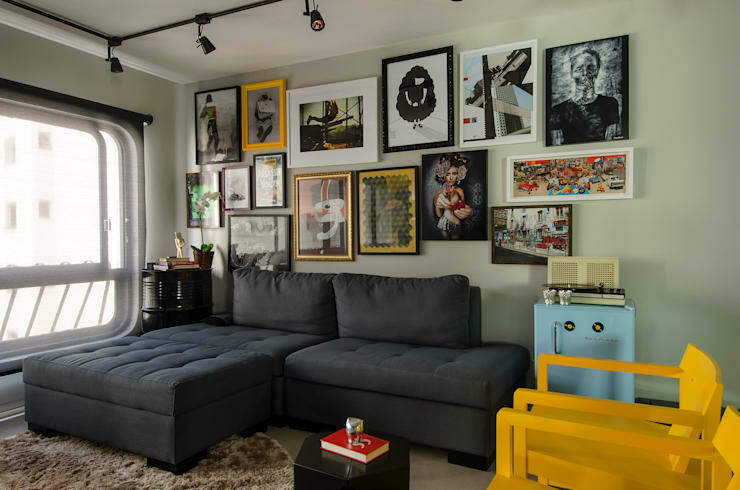 If you want to avoid cluttering up your wall space with bulky items, an art wall is a perfect alternative. Not only does art add visual variety, it will give your home a personality all of its own. To really draw the eye upward, install dedicated ceiling spotlights as seen here. The spotlights will create pools of light for a dramatic impression to really show off your wall of art. Now while high shelves are possibly the most common option we might consider, there's nothing common about these high shelves. What really makes them pop is the relatively simple and cheap addition of strip lights under the shelves. Again they draw the eye upward and really lift our attention to the upper level of the room. 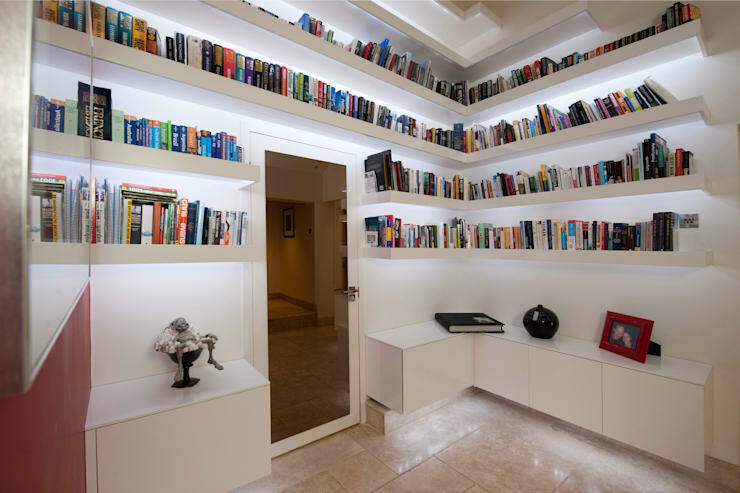 Um, we should probably add that the lights may help you find the right book too! If you are interested in shelving ideas, you'll love this Ideabook From classic to modern: interesting display options. Which of these ideas for high ceilings are your favourite? We'd love to hear in the comments below!